The Cullentra Trail is a looped 7.63km trail which begins and finishes in the centre of the village, with the trailhead sign located at the graveyard wall. Follow the red waymarked posts from here out along the trail to enjoy sweeping views out over County Wexford, all the way to the coast. Within 2 hours you should be back in the village where you can enjoy refreshments in the local shop or pubs. 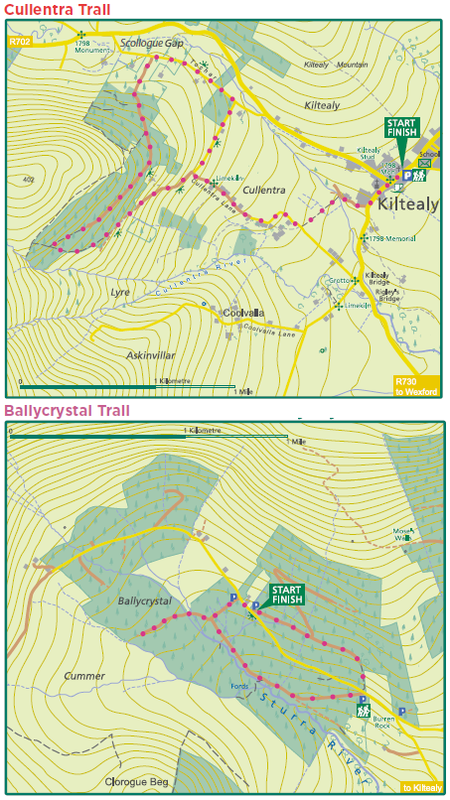 The Ballycrystal Trail begins about 5km from Kiltealy village. From the village trailhead, drive out of the village towards Enniscorthy and follow the directional fingerpost signs to the start of the trail, up in the valley under Mt. Leinster, atop which sits the Radio Teilifís Éireann television transmitter. This is a looped 3.4km trail through the forest that mostly follows the forest roadways and is marked by purple waymarked posts. Heritage features nearby including: Neolithic Stone on Shannon’s Lane (and in Rathana) and Giant’s Seat on Knockroe.